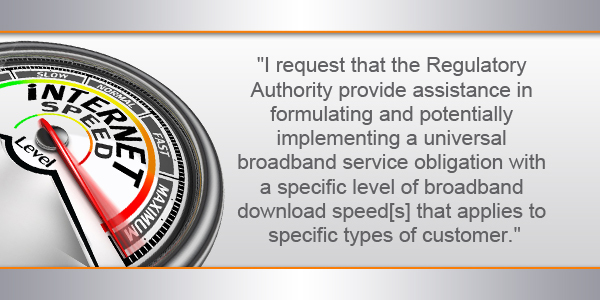 “Therefore in accordance with Section 33 of the ECA, I request that the Regulatory Authority provide assistance in formulating and potentially implementing a universal broadband service obligation with a specific level of broadband download speed[s] that applies to specific types of customer. “ii] The consultation should also assess whether any such potential broadband service obligation mandated upon specified operators should apply to the services provided to all residents, businesses and Government owned entities [e.g. schools and Government offices] within Bermuda and to 100% of the geographic coverage of Bermuda. Please get this done, Bermuda is so far behind the rest of the world. With OneComms new fiber network in the works, 50mbps will be easy and 100mbps should be no problem too. It would be nice if the regulatory agency regulated the pricing though. lol Currently our cousin island Cayman is enjoying 100mbps for the same price that we pay for 25mbps. Meanwhile upload speeds continue to lag even further behind the rest of the world. Few people upload. The 4Mbps you get is more than enough for Skype, FaceTime, Dropbox, etc. You don’t have a YouTube channel do you? Thank you. The 20th Century is behind us. Warp speed ahead. 50Mbps has always been available in Bermuda but it’s not all about the internet providers. The issue is that being an island and only 3 cable systems to us with no economies of scale or cables leading to or from other islands or countries like Europe or the Caribbean, who will purchase the additional bandwidth off island needed to meet these needs? 50 Mbps is readily available. Problem is most people cannot afford it. Same goes for 100mb. Putting fibre optic cable to the home is happening. It does not mean it will be any cheaper. They need to refresh their pricing. Slower speeds will be cheaper. Check the historical trends of Internet pricing in Bermuda.